Nanosize pores can turn semimetallic graphene into a semiconductor, and from being impermeable into the most efficient molecular-sieve membrane. These emerging properties places nanoporous graphene at the focus of different fields of science and technology due to its potential application as active component of electronic and photonic devices, or as an atom-thick selective nanosieve for sequencing, ion transport, gas separation, and water purification. The challenge is to nanostructure graphene with the right dimensions and the required precision. Room temperature semiconducting applications require gaps that can only be achieved by narrowing the graphene stripes between pores below ~3 nm. Likewise, selectivity in molecular sieving requires pores of similar size. At this scale, gap homogeneity and sieving selectivity can only be achieved with atomic scale structural homogeneity, a resolution that is not accessible to top-down nanofabrication techniques (a fluctuation of a single carbon atom in the width of a graphene stripe of this scale can lead to gap variations as large as 50%). Inspired by on-surface routes to synthesize covalent carbon-based nanostructures, we have devised a bottom-up strategy for the formation of nanoporous graphene that exhibits both semiconducting and nanosieving functionalities. The hierarchical method consists on a series of thermally activated reaction steps that lead first to parallel arrays of nanoribbons that later couple to form the nanoporous material. Using this holey graphene, we have fabricated field-effect transistors with on/off ratios 3 orders of magnitude larger than those achieved with standard, continuous graphene. Sequence of the hierarchical synthesis of nanoporous graphene, from the precursor monomer on the left, to the final structure on the right. Scanning tunneling microscopy images (bottom) of each step are accompanied by the corresponding schematic model (top). The taste of the chocolate cake’s icing should not depend on whether it is served on a porcelain or silver plate. Similarly, for chemical reactions on large metal particles the support on which the particles are deposited should not play a crucial role, because atoms noticeably affect only their immediate vicinity. It was believed that for catalytic particles containing thousands of atoms the support should not affect chemical reactions occurring far away from it. 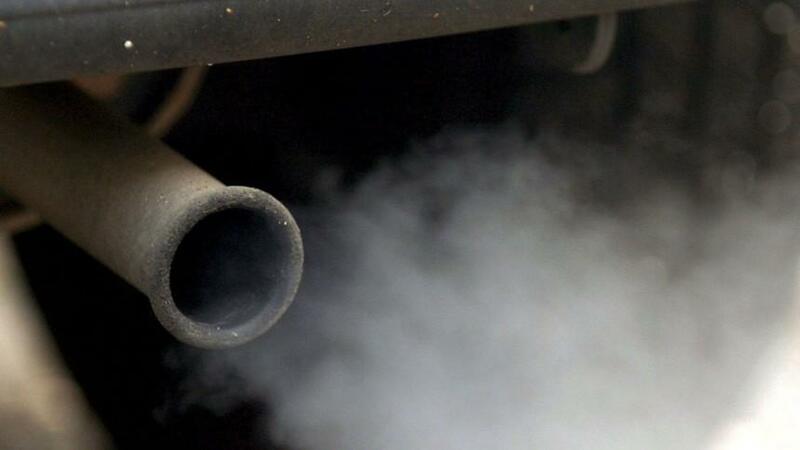 However, an astonishing long-range effect of supports has been discovered, which can make car exhaust catalytic converters more efficient, in particular, for decreasing emissions of toxic carbon monoxide (CO). The results published in Nature Materials magazine were obtained from experiments performed by Prof. G. Rupprechter and co-workers (TU Vienna, Austria) and understood by computational modelling led by team of ICREA Professor K. Neyman (Universitat de Barcelona). Surprisingly, chemical processes on palladium microcrystalline particles used as exhaust gas catalysts changed significantly when such particles were supported on chemically inactive metal oxides. CO produced by combustion engines must be converted into CO2. This is achieved by catalysts containing palladium and platinum. The present study dealt with chemical reactions on micrometre-size palladium grains. For grains supported on oxides of aluminium or zirconium the resulting catalysts remained active at notably higher CO presure. 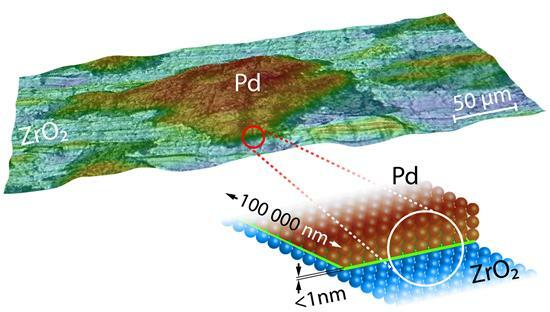 Remarkably, less than a nanometre wide contact line between grains and support influenced CO oxidation reactions on the surface of the entire palladium grains that are hundred thousand times larger. Visualisations by a photoemission electron microscope revealed that catalyst deactivation always starts where a grain contacts the support and from there deactivation spreads like a tsunami wave over the whole grain. Hence, the contact line with the supports is pivotal for modifying chemical properties of supported grains. These observations are rationalized by calculated stronger binding of oxygen on palladium atoms in direct contact with the support. Air pollution by cars is an acute problem for people’s health in many cities worldwide. Image from Catalunya Press, Monday, March 6, 2017. A tiny contact line between Pd grain and support strongly affects CO oxidation on the entire grain that is hundred thousand times larger. Suchorski Y, Kozlov SM, Bespalov I, Datler M, Vogel D, Budinska Z, Neyman KM & Rupprechter G 2018, 'The role of metal/oxide interfaces for long-range metal particle activation during CO oxidation', Nature Materials, vol. 17, pp 519-522. Each chemical reaction that happens in our body would not take place in a timescale compatible with life without the presence of substances called enzymes. Enzymes therefore make life possible. These molecules able to accelerate the chemical reactions are called catalysts. Among all existing catalysts, enzymes are the best ones, as they are capable of accelerating the chemical reactions that take place in our body by many orders of magnitude. The use of enzymes in industry is, however, still quite limited as they were not optimized for the industrial conditions. Thus, modifying natural enzymes for broadening their scope and applicability in industry is highly appealing given their high potential. Much fundamental and applied research is being carried out to understand the mechanism of action of catalysts and propose modifications to the enzyme structure to improve their efficiency. Although it was originally thought that enzymes present a single conformation of their structure, experimental and computational evidences have demonstrated that they can adopt multiple conformations in solution. In fact, enzymes are highly dynamic and can be described as ensembles of differently populated conformations. 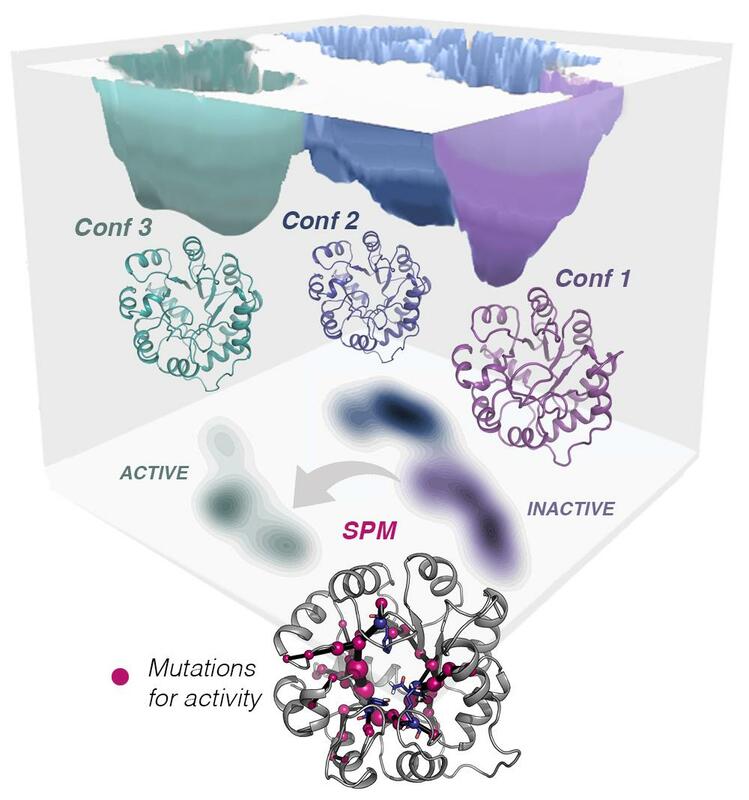 In the group, we have demonstrated that by introducing mutations to the enzyme, the populations of the accessible conformational states can be tuned, thus enabling emergence of novel function. We found that careful analysis of the conformational ensemble of enzymes is key for modifying the enzyme ability to accommodate alternative industrially-relevant substrates, and even increase the activity towards some residual promiscuous reactions of interest. We have also developed a new computational tool, that we call Shortest Path Map (SPM), which analyzes the different conformations that the enzyme can adopt and identifies which positions of the enzyme are more important for favoring a desired conformation and enable novel function. Our new developed approach provides the enzyme (re)design field with a rational strategy to determine promising sites for enhancing novel activity through mutation. Enzymes adopt multiple structures in solution (check green, blue, and purple structures). All of these structures are key for the enzyme function, i.e. accelerating the chemical reaction it was designed for. By introducing changes (i.e. mutations) to the enzyme, its activity can be tuned and enhanced towards industrially-relevant reactions and substrates. Maria-Solano MA, Serrano-Hervas E, Romero-Rivera A, Iglesias-Fernandez J & Osuna S 2018, 'Role of conformational dynamics in the evolution of novel enzyme function', Chemical Communications, 54, 50, 6622 - 6634. Serrano-Hervas E, Casadevall G, Garcia-Borras M, Feixas F & Osuna S 2018, 'Epoxide Hydrolase Conformational Heterogeneity for the Resolution of Bulky Pharmacologically Relevant Epoxide Substrates', Chemistry-a European Journal, 24, 47, 12254 - 12258. Stem cells are pluripotent cells that can continuously generate new stem cell and/or cells that differentiate to a particular phenotype. Normal stem cells are required in tissue regeneration while cancer stem cells are critical in tumor initiation. The transcription factor ZEB1 promotes the reprogramming of malignant cells toward a stem-like plastic phenotype. Consequently, its expression associates with poorer prognosis in most human cancers. However, the role of ZEB1 beyond cancer remained understudied. We now show that different levels of ZEB1 are required for both tissue homeostasis and cancer progression. Thus, we found that ZEB1 protects skeletal muscle from atrophy. Using a Zeb1 deficient mouse, we showed that muscle myofibers require full levels of ZEB1 to maintain their normal size. The downregulation of Zeb1 in myofibers to just half of the normal levels enhanced muscle wasting in response to immobilization through repression of so-called atrogenes (Ninfali et al). We previously reported that induction of ZEB1 in epithelial cells by oncogenic signals (e.g., Wnt, KRas) is not sufficient for ZEB1 to promote tumor progression that requires a super-induction of ZEB1 through additional oncogenic mutations (e.g., RB1 plus KRas, Wnt plus KRas). We have now found that adenoma cells within hypoxic niches divide asymmetrically to produce tumor-initiating cells where ZEB1 is upregulated and prompts the differential distribution of other factors to determine the fate of cancer stem cells upon division (Liu et al). ZEB1 protects skeletal muscle from damage. ZEB1-positive muscular fibers (green) are protected from injury while ZEB1-negative muscular fibers (expressing CCL2 in red) are damaged by inflammatory immune cells. Ninfali C, Siles L, Darling DS & Postigo A* 2018, "Regulation of muscle atrophy-related genes by the opposing transcriptional activities of ZEB1/CtBP and FOXO3," Nucleic Acid Res, 46, (20):10697-708 (* corresponding author). Liu Y, Siles L, Lu X, Dean K, Cuatrecasas M, Postigo A* & Dean DC* 2018, "Mitotic polarization of transcription factors during asymmetric division establishes fate of forming cancer cells", Nature Communications, 9:2424 (* co-corresponding authors). NOTE: Selected by the journal for "Editors' Highlights"
The gomphotheres are a family of extinct elephants related to the mammoths that inhabited Eurasia and the American continent. They reached South America during the Great American Interchange when the Isthmus of Panama connected the two continents. The extinction of gomphotheres in South America is relatively recent and linked to the phenomenon of disappearance of the megafauna during the late Pleistocene, approximately between 12,000 and 10,000 years ago. Their paleontological interest lies in the fact that gomphotheres, as other megafauna, have played an important role as ecosystems engineers in shaping past vegetal landscapes, considering that they became very numerous and with a high demand for biomass. For these reasons, they are considered key actors in the investigation of the extinction of the megafauna. The paleodiet of the gomphotheres from Central Chile was studied using a multi-proxy approach, including dental microwear, stable isotopes and the microfossils from the dental calculus preserved in the teeth. Each of these proxies are providing access into different windows in the life history of the gomphotheres. In other words, the diet and the environment could be determined from the first months or years of life until the last days before the animal died. The results of this study show that gomphotheres from Central Chile had a diet dominated by the consumption of leaves from trees or bushes, and to a lesser but complementary extent, of herbaceous plants. This multiproxy study widens potential occupied habitats to closed-canopy forests. This habitat variability supports the hypothesis that the diet of gomphotheres appears to be more constrained by resource availability than by the potential dietary range. This availability of resources changed throughout the Pleistocene depending on glacial and interglacial periods. The study highlights the importance of Central Chile as one of the most significant areas in South America for the research on large mammalian refuges during glacial periods and for the study of the extinction process of its megafauna during the last Ice Age. Reconstruction of a community at the time gomphotheres were roaming the Chilean lands. Drawing by Martín Chávez. Gonzalez-Guarda E, Petermann-Pichincura A, Tornero C, Domingo L, Agustí J, Pino M, Abarzua AM, Capriles JM, Villavicencio NA, Labarca R, Tolorza V, Sevilla P & Rivals F 2018, 'Multiproxy evidence for leaf-browsing and closed habitats in extinct proboscideans (Mammalia, Proboscidea) from Central Chile', Proceedings of the National Academy of Sciences of the United States of America, vol. 115, no. 37, pp 9258-9263. There exists now nothing that is merely future. As time goes by, things come to exist that did not exist before. Once they exist, such things continue to exist forever after, even if they will no longer be present. What exists increases over time, as the boundary of the present pushes into ontologically unchartered territory. These are the tenets of the Growing Block Theory, first conceived by C.D. Broad in 1923. Since its inception, the theory has been given short shrift, leaving only two contenders in the field: the view that only present things exist, and the view that what exists does not vary with time. Nothing To Come proves that the theory’s dismissal has been premature. It offers, for the first time, a coherent, logically perspicuous and ideologically lean formulation of the theory, and successfully defends it against the most notorious objections. Nothing To Come breaks new ground by showing how the theory and its competitors are derivable from more general theories consistent with relativistic spacetime, on the pre-relativistic assumption of an absolute and total temporal order. Against the backdrop of a shared quantified temporal logic, the authors devise axiomatisations of the theory and its rivals, and go on to address and defuse the charges that the theory can only be stabilised using unfamiliar resources, that it invites skepticism about our temporal location, and that it cannot heed the requirement that truths be grounded and so mandates rejection of classical logic. The most pressing challenge affecting all traditional theories of time is posed by relativistic physics and its rejection of absolute simultaneity. Nothing To Come meets this challenge head-on, replacing claims about temporal variation by claims about variation across spacetime. To this end, it devises a novel spacetime logic suited for the articulation, and comparative assessment, of relativistic theories of time succeeding their pre-relativistic counterparts. The book comes with three technical appendices which include soundness and completeness proofs for the axiomatic systems for the Growing Block Theory and its rivals, in both their pre-relativistic and relativistic forms. 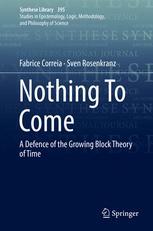 Correia F & Rosenkranz S 2018, 'Nothing To Come: A Defence Of The Growing Block Theory Of Time', Synthese Library Series, Vol. 395, Springer, New York.